Before the widespread availability of metal edged weapons and firearms, ball-headed clubs, or as they were known in the period, ‘tomahawks’ or ‘club hammers,’ were highly effective weapons. They were utilitarian implements, status symbols and ceremonial devices. 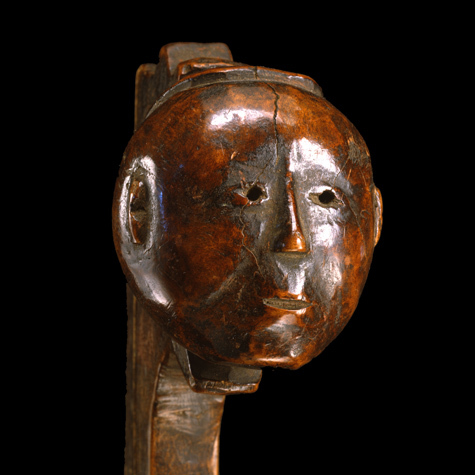 Because of its size, this club was likely part of a medicine bundle and served a ceremonial or ritualistic purpose. 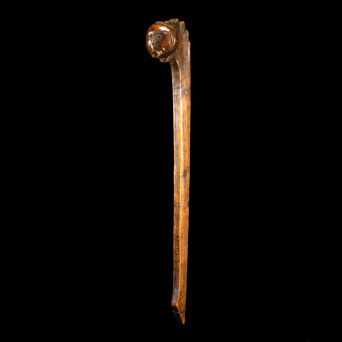 The visage carved upon the ball of the club may be representative of an ancestor of the maker or a particular warrior. The face is carved in relief with full features; it does not have some of the more reductive elements that we find on more Easterly carvings. The architecture of the club relates to other 17th century clubs that are from the Eastern Great Lakes. One, in the collection of the Rock Foundation, has a fully carved head carved on the ball or striking end—its mouth is open and its eye sockets are filled with lead. Another human effigy club likely dating from the late 18th to early 19th centuries is in the collection of the Danish National Museum. It has a Manitou or serpent carved on the top of the figure’s head and recedes down the backside of the club. The serpent Manitou on that club may relate to the bumps carved on the club shown here. From the side view, one is able to clearly see a tab carved under the figure’s chin and on top of his head. The tab on top transitions into large bumps that recede down towards the backside of the club. It can be posited that these elements make up a Manitou called Mishipizheu, or as it is more commonly referred to an Underwater Panther. The tabs are its mouth and the bumps on its back are features identified on early pictographs on Agawa Rock, Ontario, Canada and recorded on a Woodlands burl bowl and ladle (see Powers, Good Wood, Vol. I, The Evolution of the Water Manitou as Seen Through Its Presence in Woodlands Bowls & Ladles, 2008). The Manitou Mishipizheu was regarded as the most powerful being of the underworld and central to the Woodlands mythology of the Great Lakes and Northeastern regions. It was both feared and revered as a spirit of the water where it lived and was regarded as the demigod of troubled and rough waters. Mishipizheu took the form of a snakelike feline with sharp teeth, horns, “power lines” and a spiked tail.